Google Pixel Slate tablet goes official with 12.3-inch Molecular Display and Chrome OS. 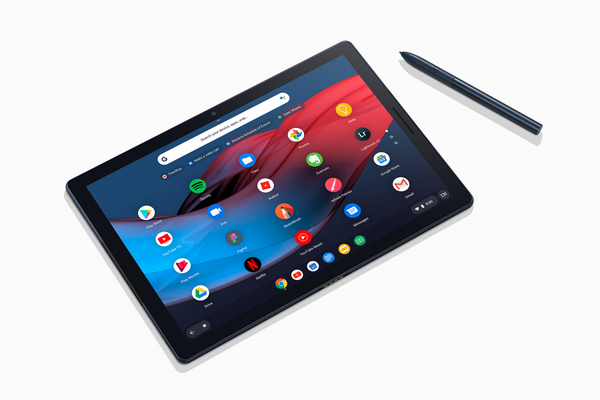 Google, along with the Pixel 3 and Pixel 3 XL, also introduced the Pixel Slate, the company's latest tablet running Chrome OS. The Pixel Slate tablet can also run Android apps via Google Play. The Pixel Slate has a 12.3-inch (3000x2000 pixels) Molecular Display and packs 293 pixels per inch-that's 6 million pixels-for the sharpest picture. Pixel Slate features rounded edges and curved 2.5D glass. At just 7mm thin and 1.6 lbs with a display that covers nearly the entire front of the device. Pixel Slate is powered by a re-imagined Chrome OS that enables easy navigation on a touchscreen. You can even run Linux if you're a developer. It makes getting things done easy, with the Google Assistant built in, and Google Play gives you access to millions of apps. Pixel Slate adds an extra layer of protection with the Titan security chip so your information, device passwords and OS are protected on your device. Google's Pixel Slate is powered by 8th Gen Intel Core/Celeron m3/i5/i7 processor, up to 16GB of RAM, and up to 256 GB storage. Pixel Slate has dual front-firing speakers that were algorithmically tuned to perfection for crisp highs and clear lows. It includes 8MP cameras on both the rear and front, and the front-facing Duo Cam provides an extra wide field of view with exceptional low light performance. You can even take great photos using portrait mode, which uses on-device machine learning to keep a single point in focus. Pixel Slate is easy to unlock too. With Pixel Imprint, the power button doubles as a fingerprint sensor, so you can unlock it just as quickly and securely as you do on your Pixel phone. Pixel Slate comes with up to 12 hours of battery life with typical mixed usage. Google's Pixel Slate also comes with built in digital wellness features like Night Light and Do Not Disturb to ensure you can disconnect when needed. You can even set digital ground rules for your family with Family Link, which gives you control over how your children's devices are used. Pixel Slate Keyboard, which pairs perfectly with Pixel Slate, includes a full-size, backlit keyboard, with round Hush Keys that let you type quietly, a dedicated Google Assistant key and an extra large trackpad. The folio is adjustable so you can comfortably work at any angle, then it turns into a slim protective case when you're on the go. Pixel Slate also works with Pixelbook Pen, which launched last year and had the lowest latency of any digital pen out there. Starting at $599, Pixel Slate comes in several configurations. Pixel Slate Keyboard is $199, and Pixelbook Pen is $99. All three will be available later this year on Google Store, and at major retailers in the U.S., Canada and the U.K.